The knee meniscus is a special layer of extra cartilage that lines the knee joint. The job of the meniscus is to cushion the knee joint and transfer forces between the tibia and femur, the thigh and shin bones. Most of the joints in our body are lined with a thin layer of articular cartilage, made of collagen and chondroitin. This provides a smooth surface over the bones allowing smooth movement. The knee joint also has an additional layer of special cartilage, called the meniscus. The reason that the knee needs this extra thick layer is to protect it from the huge forces that go through the joint as we move. Here we will look at the role of this special knee cartilage, how it gets injured and what we can do to keep the meniscus healthy. The knee menisci are two portions of thick, rubbery tissue that line the joint on the tibia. They have a fibrocartilaginous structure. They sit on the top surface of the tibia (shin bone) in two crescent shaped parts. 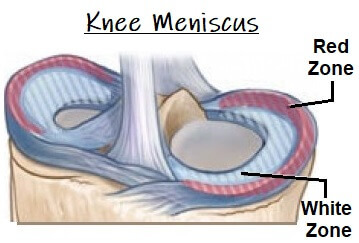 The meniscus has two distinct areas, the White Zone, which does not have a blood supply, and the Red Zone, which does have a blood supply being vascularised by the joint capsule. As the inner portion of the knee meniscus doesn't have a blood supply, tears to the White Zone do not usually heal naturally, often requiring surgery. Tears to the outer zone can heal as the Red Zone receives nutrients, oxygen and chemical via the blood from the joint capsule, however it tends to be a slow process. 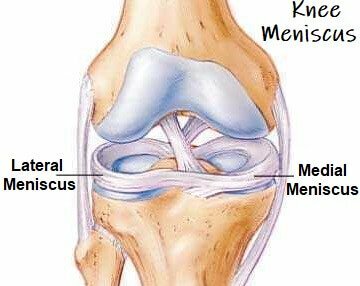 Meniscal tears can occur in any part of the cartilage (as shown in the diagram) and can take a long time to recover from. 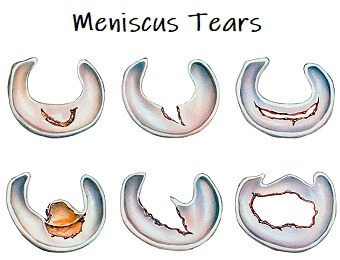 Small blood vessels feed the outer edges of the meniscus but the middle parts have no direct supply which means it is very slow to heal following injury. One of the most common signs of a meniscal tear is locking - where the knee gets stuck. This happens which a flap of torn knee meniscus gets stuck in the joint block movement. By wiggling your leg around, you can usually move the torn flap of meniscus out of the way, but the problem will keep occurring. If this is the case, arthroscopic surgery will be advised to trim the flap. To find out more about knee cartilage injuries including the causes, symptoms and treatment options, visit the meniscal tear section. How Can I Look After My Knees? We are all born with different quality knee cartilage which we can’t change, but we can help keep it healthy by ensuring that the muscles around the knee are strong so that less force goes through the knee meniscus. The best way to do this is by doing knee strengthening exercises.